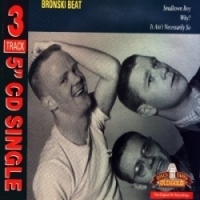 THE ETHEREAL and heartfelt melancholy of Bronski Beat's driving debut "Smalltown Boy" (UK:3, US:48) perfectly epitomised not only gay teenage problems, but became an anthem for the whole dispossessed young community. It also introduced the highly distinctive falsetto voice of Jimmy Somerville (b. 22nd June '61, Glasgow) who'd never even sung before; together with Larry Steinbachek (b. 6th May '60) and Steve Bronski (b. Steve Forrest, 7th Feb. '60) on keyboards and drum machine, Somerville's vocals were a sensation. The trio soon became a hit in London's gay clubs and were signed to London Records; "Smalltown Boy" entered the UK charts in June '84. Three months later came another fine original, "Why" (UK:6) ... and three months after that the trio pulled Gershwin's "Porgy And Bess" classic "It Ain't Necessarily So" off their debut album "Age Of Consent" for the hat trick—it hit UK:16. The album, with its USA-banned inner sleeve listing homosexual ages of consent in different European countries, hit No.4, and the next single, a clever medley of two Donna Summer tunes and John Leyton's haunting "Johnny Remember Me" hit UK:3. 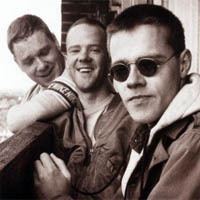 In less than a year Bronski Beat had become big stars, but the pressures were too much for Somerville. He left the trio in May '85, eventually settling into the Communards, while Bronski Beat soldiered on quite successfuly with replacement John Foster. Old Gold Records /Polygram Special Products Ltd.